I start saying sorry for my english, it's not my first language. 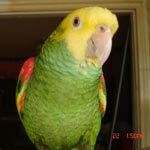 I don't know a lot about parrots and I don't own one but I really love them and almost everyday I read this forum to learn more about them. This is my situation: I know a place that people can visit, like a small zoo, they have many animals and among them there are also parrots. From the information I gathered, one of them, a male blue and gold macaw is almost eighteen years old, at the beginning he was a pet and spent most of his time with his 'owner', but since five years ago he started to attack him, like he doesn't recognize him, I think because the owner doesn't interact with the parrot anymore, he only says 'hi' to him and then goes away. When he was little, some people say four years old, something happened, no one knows exactly what, and now he can't use one of his wings (he can move it but can't open it, if this makes sense); I don't know if a vet visited him, the owner always says that he didn't do anything because he was scared that the parrot would remain traumatized and because he never was a fly lover, he prefers to walk (from what I saw he always tries to move his wings like he wants to fly). Also, a few years ago, he was put in the place where people buy tickets to go inside, and he spends day and night there (I think that they turn off the lights very late so I don't think he rest properly), he only gets attention from the staff members and the visitors. He has a little house that everyone calls 'his nest' and attacks everyone that goes near it. He also spends all his time on a branch (maybe 19 ft long), thay let him get on the ground only when the place is closed because he attacks people's feet. He seems very aggressive at first, because he tries to attack everyone that goes near his branch or his nest, but I think it's only a 'fake attack', like he wants to just scare people. I know a staff member that has a close relantonship with him, he doesn't attack her and she can put him an her arm, but she stopped doing this after one time, with no apparent reason, he bited her finger really hard. In a few weeks, sadly, she is going to move to another city so she is worried and that's why I want to help both of them. We don't know what to do, so we are asking for you help. Thank you very much. I think he needs another trip to the vet. He could be having problems that you don't see like liver damage. With an illness a bird will hide it from you. Prey animals don't want to show illness or injury. Preditors would kill a weak bird. Get him in for a vet check up. In the mean time you need to check his diet to make sure it is the best for him. Then check his routine and lighting. Don't ask anything of him, not even "step up". Give him time to become part of your family on his own. Parrots bite for reasons and you must be giving him a reason. Welcome to the forum and thank you for taking the time and making the effort to find out if there is anything that can be done for this poor, poor bird but, unfortunately, unless he belongs to an individual and this individual is willing and able to make A LOT of changes in its life, there is nothing that can be done because the bird belongs to a zoo and, apparently, there is nobody there that cares. I mean, what can you possibly do? Thank you very much for taking the time to answer to me. From what I know the staff members of this place care a lot about the animals, but they don't have any power to change things, they tried but nothing change. The parrot that I talked about is not owned by the place but by the individual that runs the place(sorry if this doesn't make any sense), but this person thinks that this parrot is okay and is happy, so he won't change anything. The staff members are not even in a position where they can say to this person "take him to the vet", because he will say excuses. I understand that I can't do anything meaningful for him, I less sad knowing that the people there take care of this parrot, as best as they can. Just two more questions, do you think that with the right changes his life can be better? Do you think, from I said before(that he can move his wing but can't open it), he can fly again? Oh, there is no doubt in my mind that, with the right care, he will do much, much better! ALL my birds came from somebody else and some of them came to me in real bad shape after living years under bad care but they are all happy and, although some are not 100% healthy [once there is liver and kidney damage, you can't really reverse it], they do VERY well with the right diet and supplements. As to his wing, no, he will never fly again. Bird wings are much more delicate and fragile than people realize... It doesn't even take a broken bone that did not heal right to make them useless, even soft tissue damage [like when another bird bites the wing] would prevent them from flying ever again because once a tendon is torn, the wing no longer works right. And, when we are talking about the big ones, if they were never allowed to fly when babies, they are grounded for life because the muscles never developed and the neural paths they need to form when they are babies never did. Thank you very much for answering me, I'm very grateful. I feel a bit useless at the moment because I can't help him, I hope that one day his owner understands that he should give him to another person or change his life completely. Me too! It bothers me something terrible when I hear of a bird not being taken care of properly but, unfortunately for them, animals are considered property and their owners can do whatever they want with them... even when it's something that is literally killing them!